Beginning with release 11.0 of Pixar's RenderMan, it is possible to invoke a sophisticated built-in ray tracing facility from within your PRMan shaders. 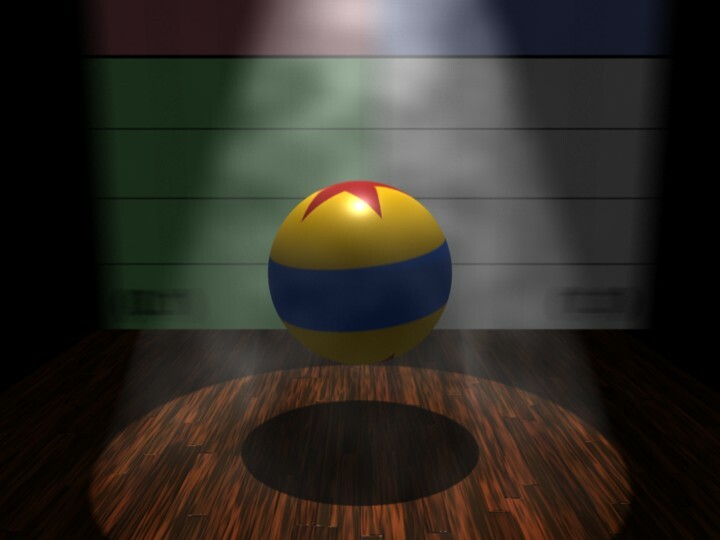 This capability was initially limited to enabling a surface shader to do things like accurately compute reflections of other objects in the scene, or to simulate effects such as refraction. 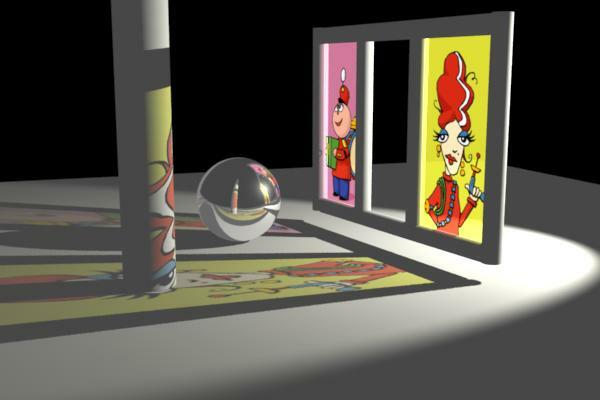 Subsequent releases have extended the capabilities and applications of ray tracing in PRMan throughout the rendering pipeline. This application note is focused on the ray-traced shading features of the renderer. Ray tracing fits into Pixar's RenderMan as an additional tool to help shader writers be more productive and create very specific special effects. It is important to remember throughout this discussion that "the way" in which rendering is done in PRMan's REYES pipeline is not changed by the addition of ray tracing. What has changed is that shaders on particular surfaces have the ability to ask some interesting questions about the geometry around them, phrased as ray-traced shadeops. The shader on the sphere calls trace. The trace() shadeop casts a single ray from a point, in a given direction. 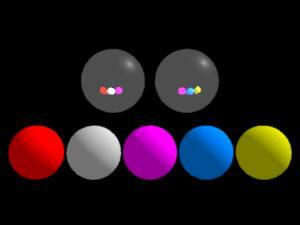 It returns the color of the surface that the ray hits, which is determined by executing the shader on the hit surface. trace has been part of the RenderMan specification for a long time, but it didn't return meaningful values in PRMan until release 11. One of the extensions added to trace is that when assigned to a float instead of a color, the output will be the distance to the intersection point; the hit surface shader won't be executed in this case. This image was created in a single rendering pass, using standard LightSource and Surface shaders from prior releases, without recompiling them. The ray-traced reflections and shadows were enabled by using the special "raytrace" keyword in the environment and shadow calls; it was passed into the existing shaders as the texture map name from the RIB file. The appropriate visibility attributes also had to be added to the RIB file to turn on the ray tracing features. Attribute "shade" "string transmissionhitmode" "primitive"
These images show the effect of changing the number of traced samples and the sampling region. Increasing the number of ray samples will reduce noise and aliasing. Increasing the sample cone size will increase the blur. 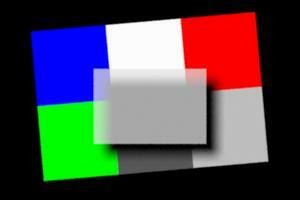 In the four test images below, a small rectangular "lens" in the foreground is floating in front of the colored grid. 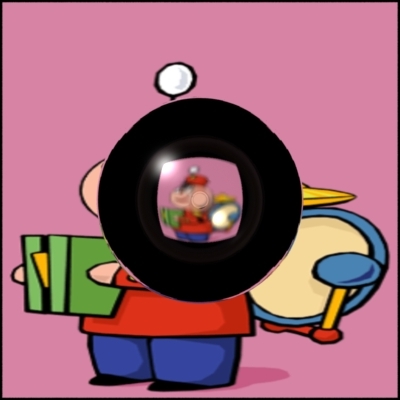 The lens is gridded according to ShadingRate, as usual. 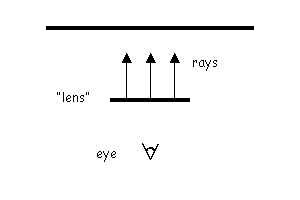 The shader on the lens traces rays from points on the lens towards the colored grid, in the "I" direction. 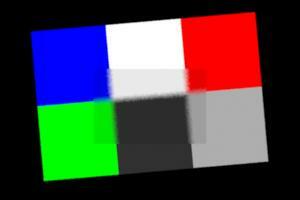 The lens "Ci" color is set to the color found by each ray on the intersected surface. Traced rays automatically continue through semi-transparent objects by default, collecting color and opacity as they go. 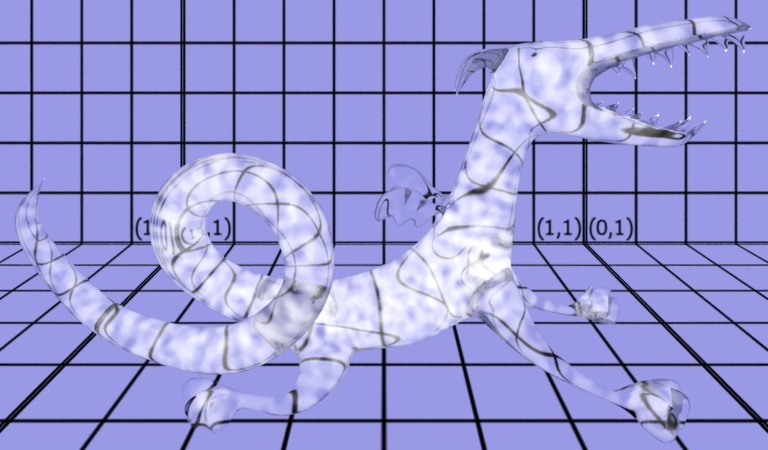 Each ray terminates when its opacity reaches the Option "limits" "othreshold" value, just like regular micropolygon samples seen directly from the camera. See the Ray Continuation and Opacity technical discussion for more details. Surface shaders, like glass, that want to control the refraction direction should set Oi=1.0; and shoot their own continuation ray in the desired direction. Auto-continuation was introduced in PRMan release 12.0; in prior versions, continuation was completely under the control of the hit shaders. Consider a simple scene containing a mirror, on the left, and three patches, on the right. The mirror shader makes a simple trace or gather call. For the image above, the patches are using the constant shader. (assuming pre-multiplied colors in the map). Compositing along the mirror rays has been explicitly disabled for this image by setting the gather parameter "othreshold", color(0). Here the default gather "othreshold" is being used, so rays automatically continue until they hit an opaque surface, compositing color and opacity along the way. Simulating object "material presence" with texture opacity in this way, sometimes called "modelling with paint," can add visual complexity to a scene using only simple "billboard" or "card" geometry. The Opacity attribute and shader output Oi drive the compositing scheme applied to camera samples and traced rays, allowing the renderer to automatically account for transparent portions of each object. So the shaders on the cards (or any object) do not need to be involved in shooting their own continuation rays when they are hit by rays from elsewhere, unless special effects are desired. In the image below, the shader on the middle card sets Oi=1.0 where the object "exists" in the texture map, disabling auto-continuation there. Then, in the areas where the texture opacity is non-zero, it shoots a refraction ray of its own in a slightly different direction, to simulate a lens, and mixes the results with its texture color. So this is an example of mixing ray-traced refraction with automatic compositing. Here are some examples of using gather() to collect values, including message-passing output variables, from shaders on surfaces hit by rays. 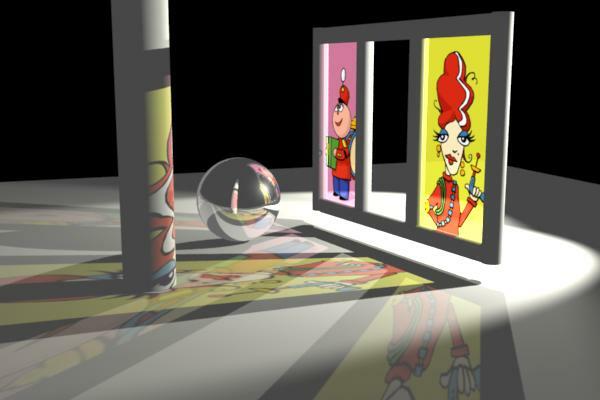 The first example is a basic scene containing a mirror. The trace() call used will be replaced by gather() in the variations that follow. The gather() output variable query mechanism can be used to query shader variables on the hit surface. We can fetch any of the regular graphics state variables, such as s and t.
Apologies for the jpeg artifacts! "Reflection" of the S and T mappings on the sphere and cone. Value of a "primitive vertex variable" supplied from the rib file. Fetching a "classic" output message variable, aka a "mailbox". We can fetch attributes from the hit surface too! 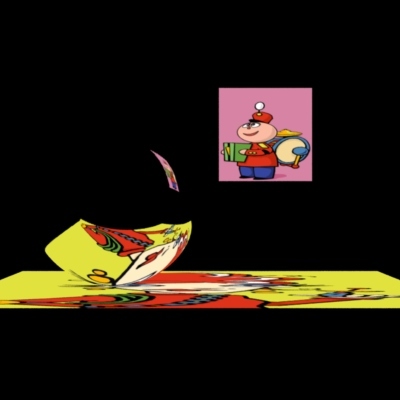 "surface:VAR" gets the variable VAR from the surface hit by the ray after the surface shader has been executed. "primitive:VAR" gets the variable VAR from the surface hit by the ray before the surface shader has been executed. Not all variables are available in this fashion (especially Ci). Note that the shader calling gather() must initialize the receiving variable before calling gather(). Otherwise values will be undefined at the grid points for which the ray hits nothing or where the requested value is not available in the hit shader. Strings cannot be used for gather() message passing. This is due to the fact that strings are not varying. Since gather() shoots rays from each gridpoint for each sample pass, it will fetch a varying result, so the results must be stored into a varying local variable. The shader on the lower ball changes how it appears in the reflections from the two upper balls by examining the label strings on the reflection rays. The "volume:" directive specifies that the hit surface color should be modified by any attached volume shaders, if they exist. For this picture, there are no volume shaders..
was attached to the dragon. The interior shader is then automatically executed when a refraction ray (using "volume:Ci") is traced from an object that has one attached. For more information on volumes and volume shaders, see Volume Rendering and Writing Atmosphere and Interior Shaders. Ray hits can be restricted to subsets of objects. All of the lower spheres have "specular" visibility turned on so that gather can see them. However, they also each have different trace group membership. Each of the upper spheres selectively traces into a subset of the groups. Ray hits can be restricted by distance. 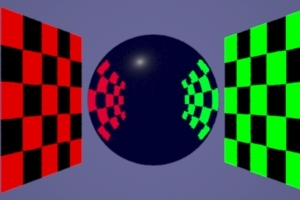 Notice that the yellow square, which is at depth 5, doesn't appear through the ray-tracing "lens" in the image on the right. The gather() call has been given a limited tracing depth, and the yellow patch is beyond the limit, so none of the rays hit it. We use the convention that the ray depth is 0 on directly visible surfaces. 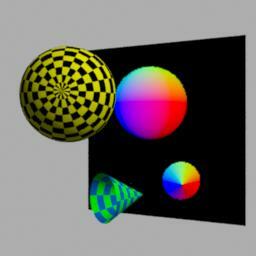 * aachrome: anti-aliased reflective chrome shader. * exponential explosion in the number of rays. * Warning: only use this shader on objects that have normals facing out! Many shaders rely on correct surface orientation of the objects in the scene. For example, the following is a simple glass shader that uses the direction of the surface normal (relative to the incident ray direction) to determine whether the ray is entering or leaving the object. This information in turn is used to compute the relative index of refraction which is used to compute the refraction directions (as well as the reflection and refraction coefficients). * reflection, refraction, and Phong specular. The images below are two examples of refraction in a glass sphere. 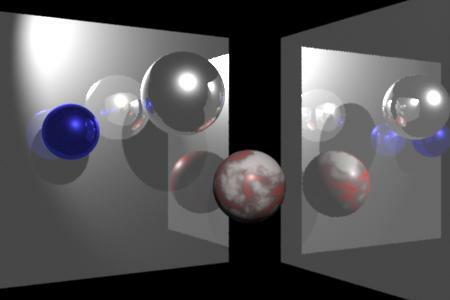 In the image to the left, the sphere's surface normals are facing out, as they should, and the refraction is as intended - refraction through a glass sphere surrounded by air. 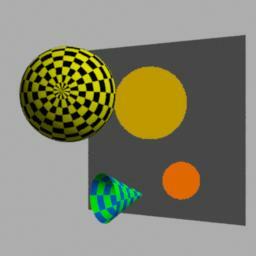 In the image to the right, the sphere has reverse orientation: the surface normals are pointing into the sphere so the inside is considered the outside. This makes the refraction look as if the sphere was an air bubble inside solid glass. 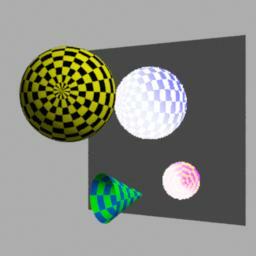 By default, ray tracing does not take object orientation (sidedness) into account. So a ray will intersect an object even if that object is one-sided and the ray hits the back side. The functions trace(), transmission(), and gather() have an optional parameter "hitsides". The possible values are "front", "back", and "both". The default value is "both", meaning that a ray will intersect both front and back sides. This preserves the old behavior. If the value is "front" or "back" and the the surface is one-sided, the dot product I.N is used to determine whether the hit side corresponds to the specified side; if not, the ray hit is rejected and the ray continues. The "hitsides" value "front" corresponds to how the camera sees (or ignores) one-sided surfaces. The opacity of a primitive is determined by the final value assigned to the variable Oi in the shader(s) attached to the primitive. The Opacity attribute attached to the primitive (Os in the shader) is typically used as the default for Oi. The renderer treats this value as a compositing hint, micropolygons are shaded and composited over each other until samples become opaque, in standard non-traced scenes. Traced rays follow the same scheme. 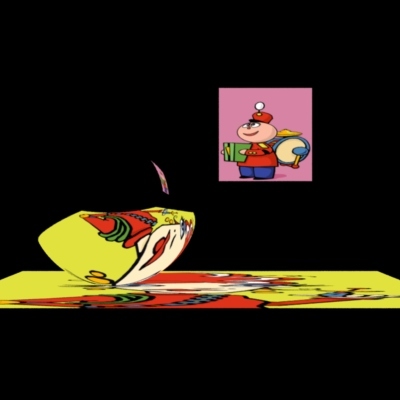 When a ray hits a primitive, the Oi from the shader on the hit surface is used to determine whether the ray should stop at that hit or automatically continue along the same direction, accumulating color and opacity as it goes. This scheme allows, for example, simple "card" or "painted" objects to simulate material presence or absence using alpha channels from a texture map. The transparent parts of these objects appear transparent in ray-traced reflections, just as they do from the camera. Note that this is straight-line ray continuation. If an effect such as refraction is desired then the surface shader on the refracting object should set Oi=1.0; (meaning opaque, no further automatic continuation) and cast a new refraction ray itself in the desired direction. 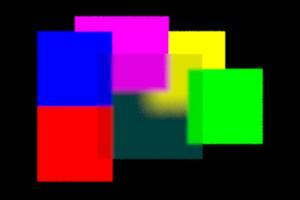 The background colors found by the refraction rays are then used to set the output color, Ci, of the refracting surface. just as for camera samples. Individual gather calls can specify their own termination criteria using gather's own "othreshold" parameter. If the value of this override parameter is color(0) then ray continuation is effectively disabled for that gather call. Passing the special value color(-1) to gather causes the default, global othreshold option value to be used, just as if the gather parameter had not been specified. Automatic continuation of trace/gather rays did not occur prior to PRMan 12.0, surface shaders instead had complete control of their own continuation rays, even on partially transparent, non-refracting objects. Older shaders that simply cast their own straight-line continuation rays in response to a ray hit should now either allow the renderer to handle the ray continuation and no longer shoot their own, or they should ensure that they are setting Oi to 1.0 so that the renderer does not interfere, or duplicate, the shader's own continuation scheme. The interaction between automatic continuation rays and gather hit/miss blocks is fairly straightforward. If a ray hits nothing at all, then the miss block is executed. "Nothing" in this context means that literally no intersections were found, or that the accumulated opacity from all intersections was completely transparent, defined as all channels of Oi and Ci less than the value specified by the gather "ohitthreshold" parameter (very small, by default). Otherwise, the ray fetches all specified values at the first hit, and continues if the resulting Oi is not opaque. Hits and fetches are repeated as necessary for subsequent surfaces until the accumulated opacity on the ray reaches the opacity threshold or no objects remain, then the gather hit block is executed. Thus, fetched variables will have the values from the last encountered surface whose shaders provided the requested items. Fetched Ci and Oi are the only values accumulated by compositing values from all hit surfaces along the ray. In some situations, shader code in the gather hit block may want to examine the fetched Oi to determine if hits on nearly transparent surfaces are actually more "miss-like" in context. Similarly, fetched ray:length may be large (maxdist) if the ray never reaches the opacity threshold, despite passing through one or more surfaces. Determining a surface's opacity from its shader's Oi necessarily involves executing the shader at the ray hit point. If the list of gather values to fetch has been carefully chosen to avoid actually having to run the shader (fetching only primitive:var, attribute:var, ray:var), then automatic ray continuation will not occur. The vertex variable "Os" on the object is used directly. If the object has no such vertex variable, the Opacity attribute value is used instead. The surface shader is not run to determine opacity. The opacity is determined with a lookup in a point cloud or brick map file. The name of the file is specified by Attribute "shade" "transmissionhitcache" "file:..." and the channel in the file is specified with Attribute "shade" "transmissionhitopacitychannel" "...". The cache hitmode was introduced in PRMan 16. This is the fully general case, shaders on all encountered objects must be run to determine their opacity, unless an analysis of the shader determines that it simply sets Oi to either 1.0 or Os. See the stained glass example above for an example in which collecting the shader's Oi output is important. Below is shown an example of a displaced object (a dark blue "blob" which is a displaced sphere) reflecting another displaced object. PRMan supports arbitrary displacements, i.e. the displacement does not have to be in the direction of the normal. Object <unnamed> (surface shader "mattedisp") only used 20% of its displacement bound. R56003 1 object used less than 50% of its displacement bounds. An important thing to consider is that even though displacement mapping is necessary for an object, it is often sufficient to use a bump mapped version for reflections of that object. It is faster to ray trace bump-mapped objects than displacement-mapped objects, so use ray-traced displacement only when necessary. Below is shown an example where bump mapping is sufficient. 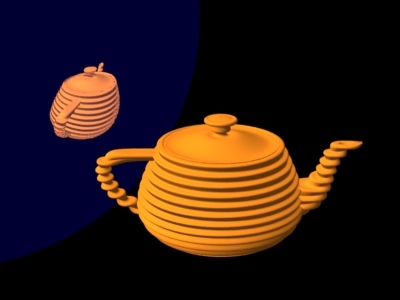 In the image to the left, the reflection of the teapot is displacement-mapped. 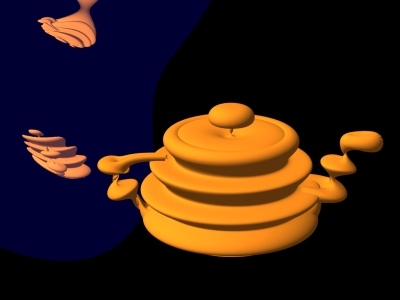 In the image to the right, the reflection of the teapot is bump-mapped. There is hardly any visual difference between the images. The reflecting object is moving. If the reflecting object is convex (for example a sphere) or concave, the reflection will move almost correctly with the moving object. However, if the reflecting object is flat, and it moves perpendicular to its normal, we would expect to see a static reflection in the moving object. But because of the "shading before hiding", we'll actually see a blurred reflection of the static object. In PRMan 15.x and earlier, do not turn this attribute on if the reflecting object is moving, too, or some of the rays (shot from the object's position at shutter open time) will hit the same object at the positions that object is in at other times within the shutter interval. A ray can even hit the very same surface point it was shot from - a kind of "ray time warp". Note that this limitation was addressed and no longer applies in versions PRMan 16 and later. 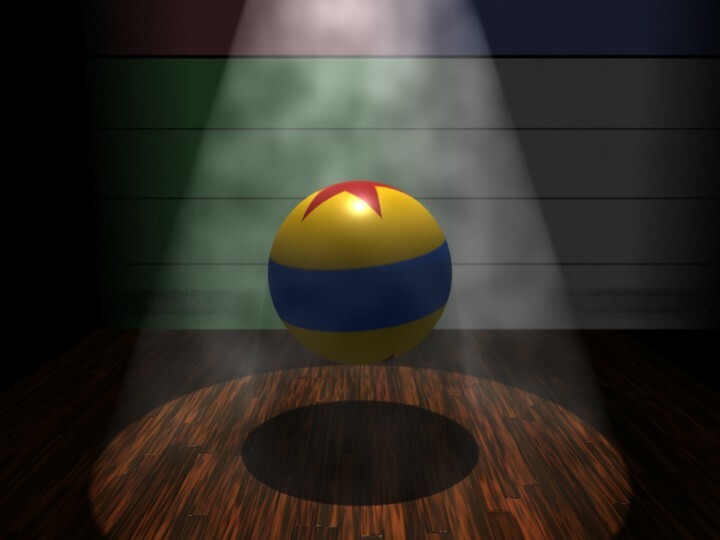 True area lights (as defined in the RenderMan specification) are not implemented in PRMan, most of the effects of area lights can be obtained using pseudo area lights. A pseudo area light is a light shader that computes illumination from multiple points in an area around the light source center position. This provides soft shadows and light that "wraps around" soft edges as from a true area light. In order to get high-quality shadows, occlusion is computed with ray tracing. The pseudo area lights in the examples below take cosine at the surface point for each sample point into account in their calculations. To "trick" the surface shader into not multiplying by the cosine again, the illuminate point is chosen such that L.N is 1 in the diffuse calculation in the surface shader. This means that these pseudo area lights only work properly for illumination of diffuse surfaces. In general, the pseudo area light shader can distribute the light sampling points on any shape. Below is shown two examples (along with a standard point light for comparison). The linear light gives soft shadows in one direction, while the spherical light gives soft shadows in all directions. Note how the shadows are sharp near the cylinder and get blurrier further away. * Linear light, an example of a pseudo area light. * point1 and point2. 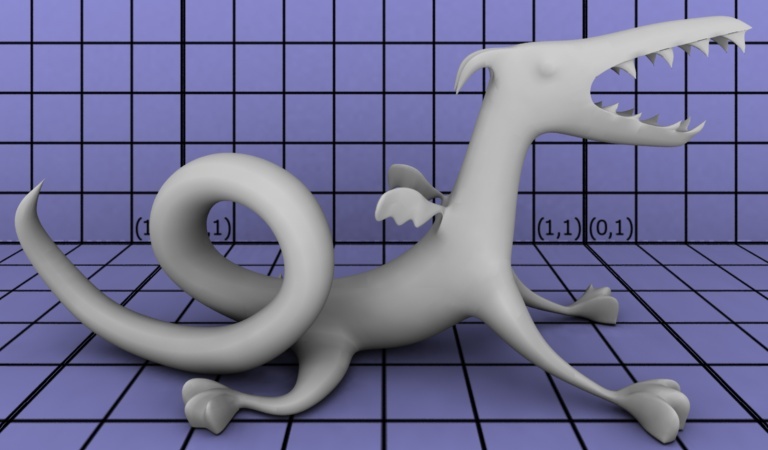 Occlusion is computed with ray tracing. * calculation in the surface shader. * Sphere light, an example of a pseudo area light. * page 81. 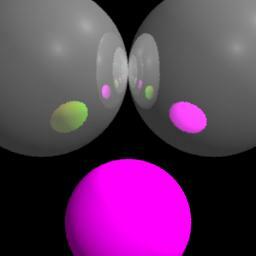 Occlusion is computed with ray tracing. 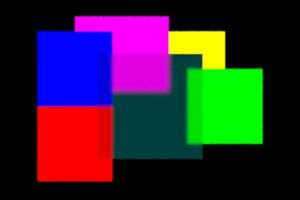 Other pseudo area light shaders (disklight, rectanglelight, and cylinderlight) are included among the standard shaders that come with the PRMan distribution. It is fairly simple to generalize them to use other shapes, texture maps for the light color, "cookies", etc. Other variations of the sphere and cylinder lights would distribute the sample points inside the volume rather than on the surface. (It might be more appropriate to refer to them as "volume lights" then?) It is also simple to combine the varied positions with restricted illuminate directions; for example, restricted by a cone (like a spot light) or barn doors. The image below shows some purely matte objects illuminated by a long cylindrical pseudo area light source - similar to a neon tube. The light source is "visible" only because there is a white cylinder placed at the same location. Notice the elongated bright illumination on the matte plane and the extremely soft shadows cast by the cylinder. Also notice how the illumination "wraps around" the cylinder. 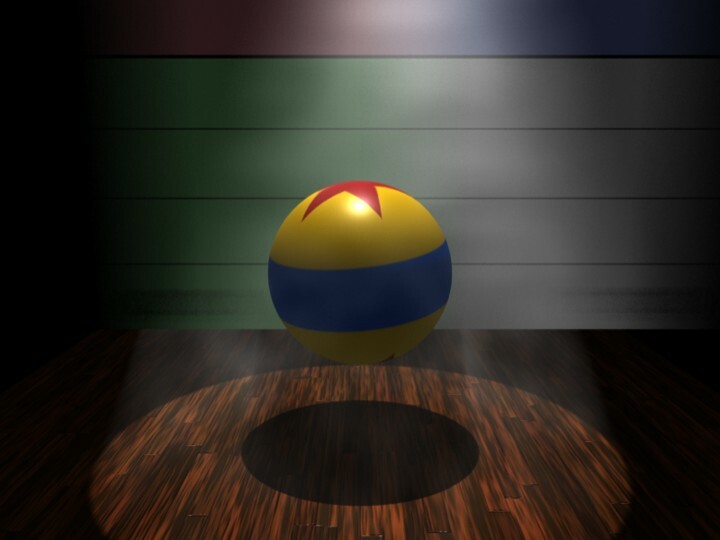 Computing soft shadows with ray tracing can be rather slow since many rays are necessary to generate noise-free penumbra regions. There are several "tricks" that can be used to speed it up. For example, in an outdoor scene on a large flat ground plane, the ground plane does not cast shadows on anything, so it should be marked as invisible to transmission. Similarly, in a scene inside a single room, the floor, ceiling, and walls do not cast shadows, so they should also be marked as invisible to transmission. Also keep in mind that choosing the appropriate transmission hitmode setting can influence run time considerably. "int transmission"  is obviously the most efficient since those objects are not considered at all for ray-traced shadows. Using "int transmission"  and "string transmissionhitmode" "primitive" or "cache" is more efficient than "string transmissionhitmode" "shader" since the latter requires evaluation of the shader for every shadow ray hit. So use "string transmissionhitmode" "shader" only when needed, as for the colored shadows in the stained glass example. Another trick worth mentioning is to use shadow maps to guide the computation of ray-traced soft shadows. This is desirable if the precise and accurate penumbras that are characteristic of ray traced shadows is needed but there are large regions of the scene with "trivial" shadows (either full illumination or full shadow). It is rather wasteful to shoot a lot of shadow rays in regions that are far from the penumbras. A shadow map can help eliminate these trivial cases. 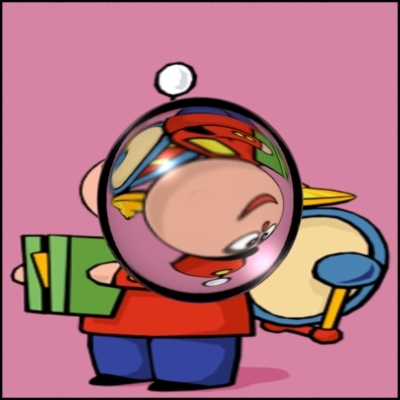 With reflection maps, there is a lot of artistic freedom to manipulate the reflections to emphasize whatever aspects of the reflected environment is desired. Similar effects can be obtained with ray-traced reflections. The opposite is an object that is only directly visible, but not visible in reflections and refractions. Since this visual behavior is similar to Bram Stoker's "Dracula", one might call such objects vampire objects. Camera visibility is on by default and raytracing visibility is off, so this is the default behavior. The images below show a few examples of twisted reflections. The scene consists of a reflective sphere and two textured squares. 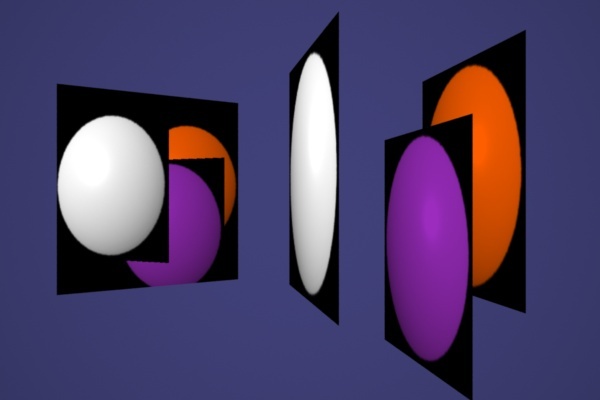 In the first image, the sphere has plain reflection without any twist. 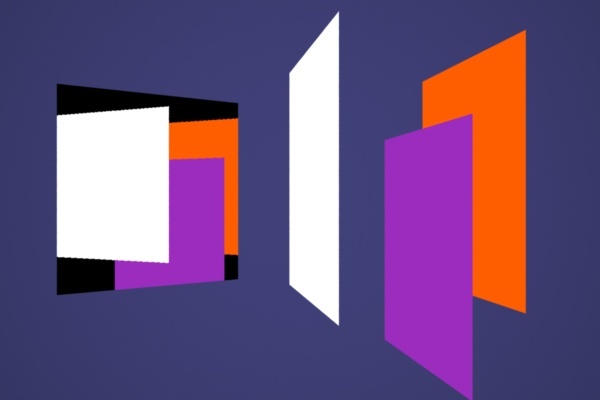 The second image has the reflection directions twisted in the direction (1,0,-1), making the reflection of the little "Tinny" square appear larger. The third image has the reflection directions twisted down by (0,-1,0), making the reflection of the horizontal "Irma" plane appear larger. Reflection direction twisted toward "Tinny"
The option overrides the rendermn.ini setting if both are specified. The intersection tests are faster since fewer quads/triangles need to be hit tested. The number of lookups in the fine tessellation cache is reduced. Overall data traffic to and from the geometry cache is reduced. For decimationrates 2 and 4, the max size of each entry in the fine tessellation cache is smaller, so the same cache memory can hold more cache entries. Under certain circumstances, the fine tessellation cache can be avoided entirely. For decimationrates 16 and higher, the fine and medium geometry caches will never be accessed, so we assign all the geometry cache memory to the coarse cache, thereby increasing its capacity very significantly. When using decimationrates higher than 1 it can sometimes be necessary to increase the trace bias. This topic is only marginally related to ray tracing; however, people sometimes try to work around the problem by using ray tracing, so it is presented here as an alternative. A standard smokey Atmosphere shader is attached the back wall and floor in this scene. Looks pretty good. If we put the back wall (only) in motion, notice how the atmosphere starts to blur too, even though visually we might like the smoke to appear fixed around the ball. If the wall is moving really fast, then the dragging "artifact" becomes very apparent. In the final picture, the wall is still highly motion-blurred, but now the smoke appears to be still, even though the smoke shader is still attached to the wall. This is accomplished by binding it as a VPAtmosphere to delay the shader execution until after all of the motion samples have been displaced to their final positions, rather than executing the shader at shutter-open time and smearing the results. There are quite a few subtleties involved in computing an optimal set of ray directions for a given distribution function. Computing stratified ray directions is slightly more cumbersome than the unstratified example above, but the noise reduction in the gather results makes stratification very important. // Compute the number of strata in r and phi directions. // times as many phi strata as r strata. // (aka. Ward isotropic glossy distribution) around the normal Ns. Writing a similar procedure for stratified, anisotropic ray directions is left as an exercise for the reader. Certain desirable special effects, such as accurate environment reflection, inter-reflection, refraction, and colored shadows can be easily handled by a general tracing facility. Also the same internal facilities are required for generating photon maps, which we use for global illumination. So has PRMan been replaced by a ray tracing renderer? Pixar's existing PhotoRealistic RenderMan product has been extended to add ray-traced shading as an integrated set of new features. PRMan continues to be based on Pixar's highly evolved version of the REYES algorithm, which has been so successful in handling large production shots. In fact, Pixar continues to add interesting new features and performance enhancements to the core renderer, independent of ray tracing, often in response to our own demanding feature film requirements. Ray tracing has been added to the shader writer's toolkit, in an advanced form which builds on the tracing proposal that has been part of REYES all along. PRMan still efficiently sets up primitives for rendering as it always has, but now shaders that execute on those primitives have the ability to use several built-in ray tracing operators to probe other geometry in the scene. The techniques that long-time PRMan users have learned and refined will continue to be useful and effective, ray tracing just adds to the bag of tricks. Indeed, many scenes will not benefit from adding ray-traced effects, but they can now be added when required in a fully integrated fashion. Will the addition of the ray-tracing features degrade performance or hurt the memory footprint of shots that don't use them? No. 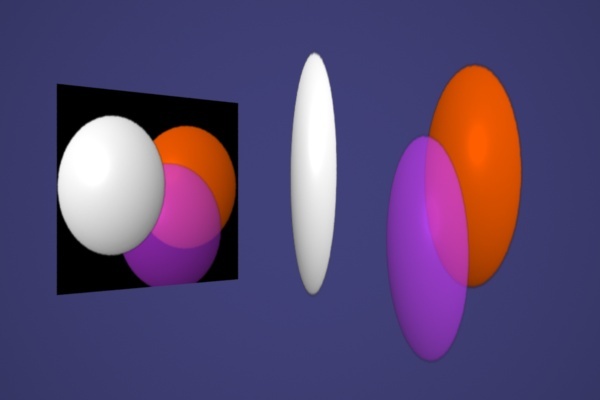 Ray tracing only occurs if shaders explicitly call ray tracing functions, and rays only intersect objects which are explicitly added to the tracing database via the visibility attributes. So all objects visible to the camera will be distributed into REYES buckets as usual. Nothing will be considered for ray tracing by default, and no additional processing will be incurred. What's transmission()? How do you expect it to be used? Note that transmission() always returns a color, which is the per-channel transmission, since intervening transparent colored objects will affect each channel differently. So a result of (1,1,1) means a completely free path from A to B, (0,0,0) means completely obstructed. The name "transmission" is intended to convey the idea that we're computing how much of the light's power gets through. Transmission can also compute blurred, multisample results. Be careful in these cases to list the point which should be the apex of the sampling cone as the first argument; as in the usage example above, Ps is first so that the correct soft-shadow look can be acheived by adding a multisample parameter and a non-zero cone angle which simulates a broad lightsource. shadow() itself has been extended so that it can optionally compute shadow values using ray tracing. If the shadow-map filename is the special keyword "raytrace" then the same underlying mechanism used by transmission() will be called automatically. This allows existing lightsource shaders to be used, without recompiling them; the invoking RIB file simply needs to supply a different shadowname (and it can skip the shadow map-generation pass for the given lightsource as well). What's the deal with the different ray types? If you're in a surface shader, it is often useful to do different things depending on why you are being run. If you are being run because your surface was hit by a ray generated by the trace() call then you might want to do something different than if you are being probed by a transmission() call. Similarly, your shader might need to know when it was run due to a photon intersection. Since the rayinfo() shadeop can be called from any shader, we also provide an answer for the case when shading is happening due to regular old PRMan shading, this is type "camera". Why do we need trace bias? Option "trace" "bias" compensates for differences in the way surface geometry is computed when seen from the camera versus being intersected by a ray. This compensation is analogous to shadow bias, which compensates for differences in the surface representations between the currently executing surface shader and the values stored in shadow maps. Traditional PRMan surface shaders are run on geometry that is diced appropriately when seen from the camera. If those shaders cast rays into the scene, a different geometric evaluation is performed which is more appropriate to the ray and its accuracy requirements. Trace bias compensates for this difference in surface evaluations, and is particularly important when looking for self-intersection with the surface that launched the ray. We definitely want self-intersection, in general, especially for self-shadowing; we just don't want to find an inappropriate intersection with the "other" representation of the surface precisely at the ray origin. So, the shadow bias option is ignored for ray tracing because it applies specifically to the accuracy of shadow maps. Instead we use trace bias, which allows these two values to be set independently. Trace bias is applied as an offset to the ray origin, usually in the direction of the surface normal, if that is known; otherwise it is applied in the direction of the ray. Also note that smaller trace bias values can increase rendering time. This happens because the higher precision causes fewer primitives to be trivially rejected during hit tests, and instead a more exact primitive intersection computation must be done at the ray origin. NEW in PRMan 19.0: There is a new Attribute "trace" "autobias", which is on by default. With this attribute on, an appropriate bias value is automatically computed and it is no longer necessary to set Attribute "trace" "bias" on a case-by-case basis depending on the scale of your objects. In fact, the trace bias attribute is ignored. The automatically computed bias depends on the size of the tessellated micropolygons, displacement, and other things. In the rare case where an explicit trace bias setting is preferable, turn "trace" "autobias" off (i.e. set it to 0). There are two parts to the automatically computed bias: 1) A very small multiplier on the objects' floating point numbers to avoid floating-point numerical precision issues. 2) To avoid false self-intersections of micropolygon grids, particularly along edges of the grids where the tessellations might not match their neighbor grids exactly, we need the bias to depend on the size of the micropolygons. (This is even more of an issue for displaced geometry.) So we set the bias to a small fraction of the micropolygon size for surfaces that are tessellated. The automatically computed trace bias is the max of 1) and 2). How do I deal with "missing" message-passing variables? Say some shaders have an output parameter: myout, but others do not. Also, say we want the ray tracing shader to only have an effect if this variable exists. How should that be handled? In this case we reset myoutTemp to something harmless so that if the next pass has unfetched grid points, they'll just contribute "0" to the accumulating total. Per Christensen, David Laur, Julian Fong, Wayne Wooten, and Dana Batali. 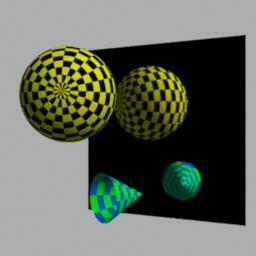 Ray Differentials and Multiresolution Geometry Caching for Distribution Ray Tracing in Complex Scenes. Computer Graphics Forum (Eurographics 2003 Conference Proceedings), pages 543-552. Blackwell Publishers, September 2003. Per Christensen, Julian Fong, David Laur, and Dana Batali. Ray tracing for the movie 'Cars'. IEEE Symposium on Interactive Ray Tracing 2006, pages 1-6. IEEE, September 2006.